When it comes to the dream of commercial space exploration and space tourism, a few names really stand out. In addition to Elon Musk and Jeff Bezos, you have Richard Branson – the founder and CEO of the Virgin Group. 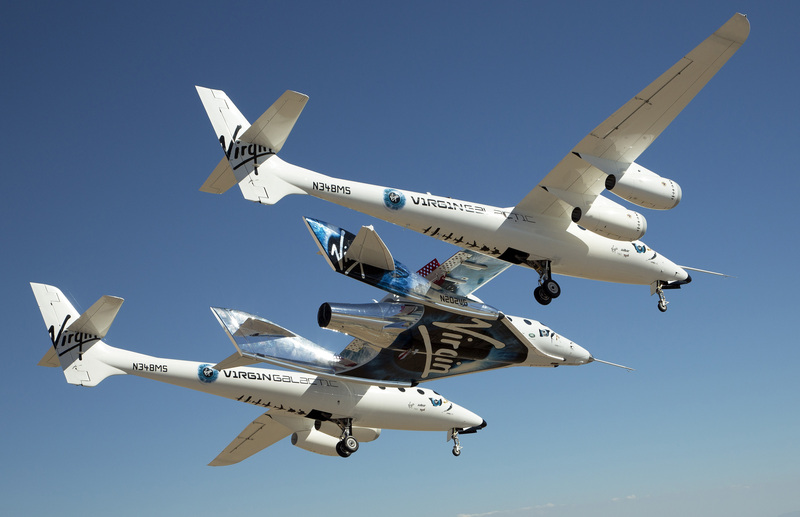 For years, Branson has sought to make space tourism a reality through Virgin Galactic, which would take passengers into suborbit using his SpaceShipTwo class of rocket planes. Unfortunately, Virgin Galactic suffered a number of setbacks in recent years, at the same time that competitors like SpaceX and Blue Origin emerged as competitors. However, the VSS Unity (part of the Virgin Galactic fleet) recently conducted its second powered test flight from the Mojave Air and Space Port on Tuesday, May 29th. While this test is years behind schedule, it marks a significant step towards Branson’s realization of flying customers to space. This was the second time that the VSS Unity flew since 2014, when the VSS Enterprise suffered a terrible crash while attempting to land, killing one pilot and injuring the other. The first propulsive test took place two months ago after several additional tests were performed on the craft. And with that last success, Virgin Galactic moved ahead with its second powered test earlier this week. This statement is a possible indication that the test program is reaching the final stretch before Virgin Galactic allows passengers on the vehicle. However, the company will need to conduct a full-duration flight (which will include a full-duration burn of its rocket motor) before that can happen. This latest test involved only a partial rocket burn, but nevertheless demonstrated the spacecraft’s capabilities at supersonic speed. By 9:43 AM, the company announced that the VSS Unity had detached from the VMS Eve and was “flying free”. What followed was a series of live-tweets that indicated the ignition of the VSS Unity’s rocket motor, the shutting down of the motor, and the raising of the tail fins to the “feathered” re-entry position. By 9:55 AM, the company announced a smooth landing for the VSS Unity, signaling the end of the test. Branson was also at the center to take in a tour of the facilities of The Spaceship Company (TSC), a sister company of Virgin Galactic that is responsible for developing Virgin Galactic’s future fleet. While there, Branson viewed the next two spaceships that TSC is currently manufacturing, as well as the production facilities for TSC’s spaceship rocket motors. Meanwhile, Bezos continues to pursue his plans for sending passengers into orbit using his fleet of New Shepard rockets. And of course, Musk continues to pursue the idea of sending tourists to the Moon and Mars using his Big Falcon Rocket (BFR). And with many other private aerospace ventures looking to provide trips into orbit or to the surface of the Moon, there is sure to be no shortage of options for going into space in the near future! Call it Space Survivor. Thirteen years after that now-classic desert island nightmare premiered on NBC, the executive producer behind Survivor is planning to host another reality competition that will land the winner a rocket trip to space. We don’t know yet what feats of strength, endurance, intelligence or teamwork (or is that backstabbing?) will be needed to score a trip with Virgin Galactic. A press release simply promises a “groundbreaking, elimination competition series where everyday people compete for the ultimate prize”, but we sure hope a lot of the individual contests are space-related. “For the past 10 years I have relentlessly pursued my dream of using a TV show to give an everyday person the chance to experience the black sky of space and look down upon mother Earth,” stated executive producer Mark Burnett, who heads One Three Media. Burnett seems to have chosen the Richard Branson-backed SpaceShipTwo (now doing powered flight tests) as the best chance of getting competitors into space in the near future. Sir Richard Branson hugs designer Burt Rutan as they are surrounded by employees of Virgin Galactic, The SpaceShip Company and Scaled Composites watch as Virgin Galactic’s SpaceShip2 streaks across the sky under rocket power, its first ever since the program began in 2005. Burt’s wife Tonya Rutan is at right taking their photo. The spacecraft was dropped from its “mothership”, WhiteKnight2 over the Mojave, CA area, April 29, 2013 at high altitude before firing its hybrid power motor. Virgin Galactic hopes to become the first commercial space venture to bring multiple passengers into space on a regular basis. Virgin says its first spaceflight with SpaceShipTwo will be in 2014, and soon after it will open the manifest to the more than 600 folks who have purchased tickets. As for when we’ll expect to see Space Race hit the airwaves, let’s just caution that this is just an agreement so far and nothing firm has been decided. Recall that in 2000, Burnett announced another deal with NBC to host a space reality show (Destination Mir), with the winner visiting the Russian space station Mir. That idea fell apart when the cash-strapped Russian Federal Space Agency elected to deorbit the aging station in 2001 and focus its resources on the International Space Station. Burnett subsequently proposed another show that would have brought ‘N Sync guitarist Lance Bass to the International Space Station, but that idea never got off the ground.